PRO PLEX 2500 belongs to the category of top protein supplements both for active people and professional athletes. It is a complex protein consisting of 6 different sources, feeding your muscles with the right protein depending on the time. It contains hydrolyzed and isolated BCAA-rich whey protein that contributes to muscle reconstruction and is available immediately post-workout. It consists of casein protein that allows a slower absorption and is a valuable source of proteins during night-time sleep. This has the effect of preventing and avoiding catabolic processes. PRO PLEX 2500 contains cofactors such as L-glutamine and glutamate peptides, as well as the special Insulin Insulin Enhancement System and the advanced nitrogene transfer system. PRO PLEX 2500 consists of high quality egg albumin, a medium-release protein source that ideally suits as an intermediate snack among largest meals. It is augmented with Vitamin C, Chromium, Niacin, Pantothenic Acid and B Complex Vitamins. It feeds your muscles with 30 grams of protein per dose, very low carbohydrates and about 1 gram of fat. NTS system helps the body store extra nitrogen in the muscles, leading the body to anabolic state. With the help of the NTS system, a number of amino acids and anabolic agents are driven into the muscle cells and remain there to trigger growth processes. IAS (Insulin Activator System) is based on scientific studies confirming that maximum protein synthesis requires high amounts of amino acids and a simultaneous increase in insulin levels. PRO PLEX's combination of chromium and d-myo inositol-insulin, supports the above-mentioned amino acid mechanism and enhances the effect of hormone transportation by supporting effective muscle growth. The additional combination of GLUTA-X2, consisting of glutamine and glutamate peptides reduces muscle tissue breakdown and it's very important in the catabolic moments of the day, such as post-workout and during night time sleep. 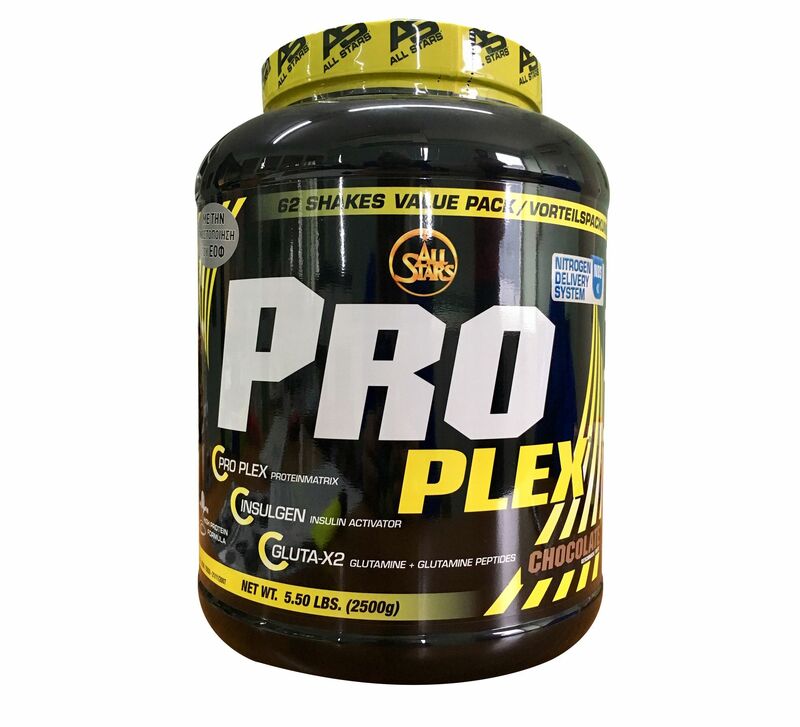 The quality and combinations of proteins contained in PRO PLEX, can lead your body to a constant anabolic state helping you experience actual results and quality development at any time of the day. The product is bundled with a free T-Shirt.